November's update features a sad tale of a lost B & G picture, which we are hoping that one of you, our web visitors, may be able to help to resolve. 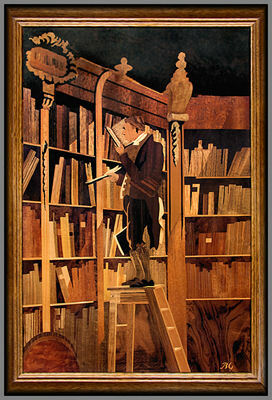 Our November update tells the unfortunate story of the loss of a much loved B & G wood inlay, this one being "The Bookworm" as seen in our picture here. Our web visitor, who we will call "Mr. Smith" lost his father recently, and the family, without Mr. Smith's knowledge, had sold off the aforementioned B & G wood inlay. Mr. Smith's mother had obtained this inlay from either Buchschmid or Gretaux themselves for his father while they were in Frankfurt, Germany in the late 1950's. Mr. Smith would now like to obtain another copy of this same piece if anyone has one they would like to sell. If you are that person, do get in touch with us and we will pass on your information to Mr. Smith so that you can conduct your transaction between yourselves. The Marquetry Society does not get involved in such transactions. We just pass on the information as a courtesy to our website visitors. Please note: We (the Marquetry Society) do not, and will not, act as brokers, intermediaries or sellers for, or on behalf, of any of our contributors. We will however, and purely as a goodwill gesture, forward your enquiry onto the owner of the piece in question so that you and the owner can conduct any sales or transactions personally and between yourselves. Our strict policy is that we do not become involved in any transactions other than our own which have previously been verified and agreed by our executive committee at a meeting set up for that purpose. The forwarding of your enquiry will be done strictly as a goodwill gesture and for no other purpose. Click the above button to return to page 60 of "Can You Help"